Our Microprocessor Tests allow you to experience an online examination in the real-time environment. In every online test on Microprocessor, you will be presented with Multiple Choice Questions (MCQs) which will test your skills in Microprocessor Concepts in a detailed and comprehensive manner. In the test, each question will have 4 options to choose from. You should select only 1 correct option as an answer and then move on to the next question. Once you submit answers to all the questions, you will be given your final test score. In the Online Microprocessor Test, for every correct answer, you will be given 2 points. There will also be negative marking of -1 for every wrong answer. So, you will have to be more careful in choosing the answers to the question in your online examination. If needed, you should skip to the next question and come back to the previous question later so that you can do proper time management for the online mock tests. 1. "Microprocessor Practice Tests" - In Microprocessor practice tests, there will be a series of practice tests wherein you can test your Microprocessor concepts on every chapter separately. There will not be any time limit on these tests. So, Microprocessor Practice Tests should be the first set of tests which you should attempt. Goto these practice tests here. 2. "Microprocessor Mock Tests" - In Microprocessor mock tests, there will be a series of mock tests wherein you can test your Microprocessor concepts on every chapter separately, but there will be a fixed time limit per test. So, it is similar to Microprocessor Practice Tests, but with an added constraint of time limits. 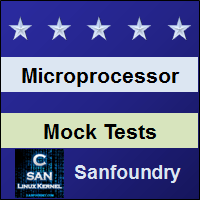 You should try Microprocessor Mock Tests if you are appearing for any online examination soon. Goto these mock tests here. 3. "Microprocessor Certification Test" - Once you are through with your Microprocessor concepts, then you should try our Microprocessor Certification Test wherein Sanfoundry will issue a free Certificate to you if you scored either Grade A* or Grade A in Microprocessor Certification Test. Goto Microprocessor Certification test here. 4. 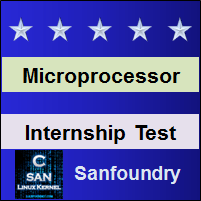 "Microprocessor Internship Test" - If you are interested to do Internships in Microprocessor at Sanfoundry, then you must take our Microprocessor Internship Test. If you scored either Grade A* or Grade A in Microprocessor Internship Test, then you are eligible for Internship at Sanfoundry in Microprocessor. Goto Microprocessor Internship test here. 5. 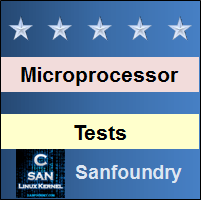 "Microprocessor Job Test" - If you are a fresher, a dropout, an experienced person and if you know Microprocessor well and looking out for jobs in Microprocessor domain at Sanfoundry (or our Network of Companies), then you should try and qualify our "Microprocessor Job Test". 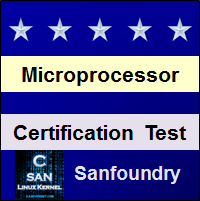 If you scored either Grade A* or Grade A in Microprocessor Job Test, then you are eligible for a Job at Sanfoundry (or our Network) in Microprocessor domain. Goto Microprocessor Job test here. For every "Microprocessor Practice Test", Total Questions: 20, Total Time: Unlimited. For every "Microprocessor Mock Test", Total Questions: 20, Total Time: 20 Minutes. For "Microprocessor Certification Test", Total Questions: 50, Total Time: 1 hour. For "Microprocessor Internship Test", Total Questions: 50, Total Time: 1 hour. For "Microprocessor Job Test", Total Questions: 50, Total Time: 1 hour. Before you get started on these series of online tests on Microprocessor, you should learn, study and practice our collection of 1000 MCQs (Multiple Choice Questions and Answers) on Microprocessor here. We also prefer that you should practice Microprocessor practice tests and mock tests completely before attempting the certification test. Here is the list of online practice tests and mock tests on Microprocessor. Each online test focuses on a "Specific chapter of Microprocessor". So, you should try both practice test and mock test on every chapter to do a self-assessment of your knowledge (along with time-limit constraints) in every area or sub-topic of Microprocessor. Microprocessor Certification test, Internship test, and Job Test are mentioned at the end of this list. 1. Microprocessor Test 1 – This set of online test on “Microprocessor” tests your skills on Machine Language Instruction Formats, Addressing Modes of 8086, Instruction Set of 8086/8088 – 1, Instruction Set of 8086/8088 – 2, Instruction Set of 8086/8088 – 3, Assembler Directives and Operators, Do's and Don'ts While Using Instructions, Programming With An Assembler, Stack. 2. Microprocessor Test 2 – This set of online test on “Microprocessor” tests your skills on Stack Structure of 8086/8088, Interrupts and Interrupt Service Routines, Interrupt Cycle of 8086/8088, Non Maskable Interrupt and Maskable Interrupt (INTR), Interrupt Programming, Passing Parameters to Procedures, Handling Programs of Size More Than 64KB, Macros, Timings and Delays, Semiconductor Memory Interfacing, Dynamic RAM Interfacing, Interfacing I/O Ports. 3. Microprocessor Test 3 – This set of online test on “Microprocessor” tests your skills on PIO 8255 (Programmable Input – Output Port), Modes of Operation of 8255, Interfacing Analog to Digital Data Converters, Interfacing Digital to Analog Converters, Stepper Motor Interfacing and Control of High Power Devices Using 8255, Programmable Interval Timer 8254, Programmable Interrupt Controller 8259A, the Keyboard/Display Controller 8279, Programmable Communication Interface 8251 USART, DMA Controller 8257, DMA Transfers and Operations. 4. Microprocessor Test 4 – This set of online test on “Microprocessor” tests your skills on Programmable DMA Interface 8237 -1, Programmable DMA Interface 8237 -2, High Storage Capacity Memory Devices, Interconnection Topologies, Software Aspects of Multimicroprocessor Systems, Numeric Processor 8087 -1, Numeric Processor 8087 -2, I/O Processor 8089, Bus Arbitration and Control, Tightly Coupled and Loosely Coupled Systems. 5. Microprocessor Test 5 – This set of online test on “Microprocessor” tests your skills on Design of a PC Based Multimicroprocessor System, Salient Features of 80286, Internal Architecture of 80286, Signal Descriptions of 80286, Real Addressing Mode, Protected Virtual Address Mode (PVAM) -1, Protected Virtual Address Mode (PVAM) -2, Privilege. 6. Microprocessor Test 6 – This set of online test on “Microprocessor” tests your skills on Protection, Special Operations, 80286 Minimum System Configuration, Interfacing Memory and I/O Devices With 80286, Priority of Bus Use By 80286, Bus Hold and HLDA Sequence, Interrupt Acknowledge Sequence, Instruction Set Features -1, Instruction Set Features -2, 80287 Math Coprocessor -1, 80287 Math Coprocessor -2, Salient Features of 80386DX. 7. Microprocessor Test 7 – This set of online test on “Microprocessor” tests your skills on Architecture and Signal Descriptions of 80386. Register Organisation of 80386 -1, Register Organisation of 80386 -2, Addressing Modes of 80386, Data Types of 80386, Real Address Mode of 80386, Protected Mode of 80386, Segmentation, Paging, Virtual 8086 Mode, The Coprocessor 80387, Enhanced Instruction Set of 80386. 8. Microprocessor Test 8 – This set of online test on “Microprocessor” tests your skills on Numeric Coprocessor – 80486DX, Features of 80586 (Pentium), Concepts of Computer Architecture, Branch Prediction, System Architecture, Enhanced Instruction Set of Pentium, Intel MMX Architecture, MMX Data Types, Wrap-around and Saturation Arithmetic, Multimedia Application Programming, Pentium III (P-III) CPU, MMX Instruction Set, Pentium – Pro and Pentium-II -1, Pentium – Pro and Pentium-II -2, Features of Pentium 4, Netburst Microarchitecture For Pentium4 -1. 9. Microprocessor Test 9 – This set of online test on “Microprocessor” tests your skills on Netburst Microarchitecture For Pentium4 -2, Instruction Translation Lookaside Buffer (ITLB) and Branch Prediction, Rapid Execution Module, Memory Subsystem, Hyperthreading Technology, Hyperthreading In Pentium, Extended Instruction Set In Advanced Pentium Processors, Formal Verification, Hybrid Architecture -RISC and CISC Convergence, Advantages of RISC, Design Issues of RISC Processors -1, Hybrid Architecture -RISC and CISC Convergence, Advantages of RISC, Design Issues of RISC Processors -2, Architecture of 8051, Register Set of 8051. 10. Microprocessor Test 10 – This set of online test on “Microprocessor” tests your skills on Interrupt and Stack of 8051 -1, Interrupt and Stack of 8051 – 2, Addressing Modes of 8051, 8051 Instruction Set -1, 8051 Instruction Set -2, Interfacing With 8051 Ports -1, Interfacing With 8051 Ports -2, Interrupt Structure of 8051, Serial Communication Unit, Power Control Register. 11. Microprocessor Certification Test - This set of online free certification test on "Microprocessor" tests your skills on all areas (all chapters, topics and subtopics) of Microprocessor. 12. 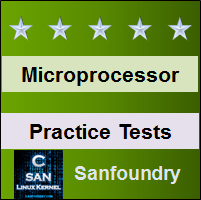 Microprocessor Internship Test - If you scored either Grade A* or Grade A in our Microprocessor Internship Test, then you can apply for Internship at Sanfoundry in Microprocessor. 13. 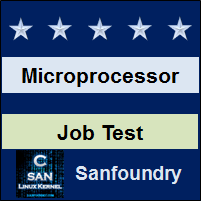 Microprocessor Job Test - If you scored either Grade A* or Grade A in our Microprocessor Job Test, then you can apply for Jobs at Sanfoundry in Microprocessor domain. Best Wishes for your Microprocessor Tests!